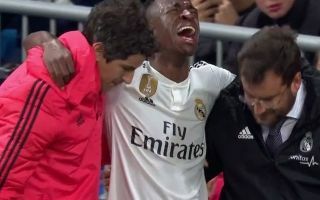 Things couldn’t be going any worse for Real Madrid this evening, as well as being stunned by two Ajax goals early on, Los Blancos have lost wonderkid Vinicius to injury. In the 35th minute of tonight’s Champions League clash, the 18-year-old sensation was forced off with what looks like a potentially serious ankle injury. Vinicius has won the hearts of fans across the world as well as the Madrid faithful following his dazzling performances for Madrid this season. The youngster is a extremely exciting player to watch and he will be a massive miss for Santiago Solari’s side, for however long he is out for. Vinícius Júnior in tears as he's forced off injured. Vinicius Junior left distraught after being forced off against Ajax.